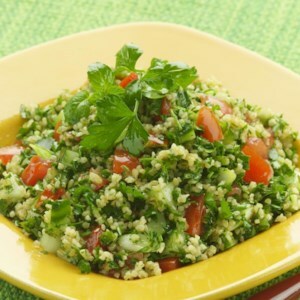 Find healthy, delicious side dish recipes with bulgur, from the food and nutrition experts at EatingWell. 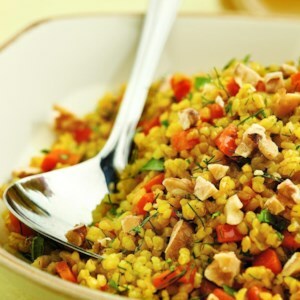 Bulgur is high in fiber and low in fat. 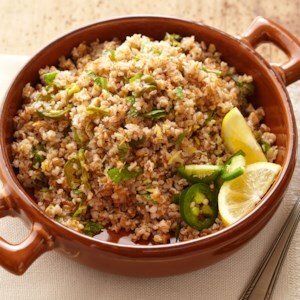 In this slow-cooked side dish, the bulgur is flavored with ginger, mint and lemon and gets a slight kick from a jalapeño chile pepper. 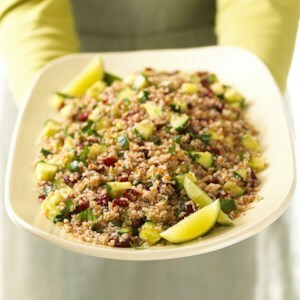 Kick up the fiber in your diet with the chewy bulgur in this fresh side dish salad. Serve the diabetic-friendly salad on its own or with beef, pork, or chicken. 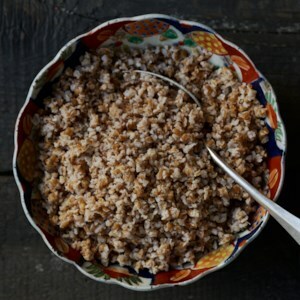 This Ethiopian buttery grain porridge recipe is often served for breakfast, but you can also top it with other dishes like messer wot (spiced lentils) or gomen (Ethiopian-spiced collards) for lunch or dinner and eat it in place of the traditional flatbread, injera. Think hummus meets tabbouleh in these vegetarian stuffed grape leaves, bursting with chickpeas, parsley and bulgur tied together with a lemony, garlicky sauce. 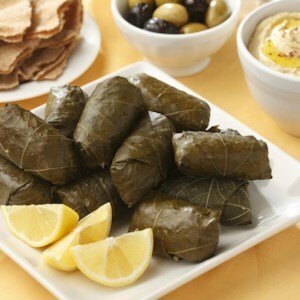 The grape leaves will seem soft when just finished cooking, but will firm up as they cool. We prefer these at room temperature or cold--perfect for bringing to work for lunch. 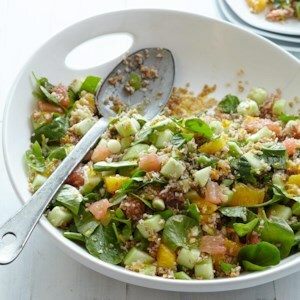 In this twist on a classic Middle Eastern tabbouleh recipe, we add juicy citrus, peppery watercress and cool, crunchy cucumber. Serve with grilled chicken or lamb kebabs, pita and tzatziki. Serve this tart, parsley-dominated tabbouleh at your next backyard gathering. Pungent mustard greens beg for other strong flavors for balance. 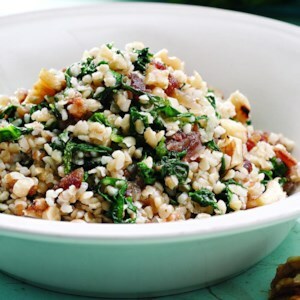 Here walnut oil, walnuts, dates, bulgur and white-wine vinegar do the trick. Bulgur is ubiquitous in Middle Eastern cooking but also pairs deliciously with Asian seasonings. This simple side dish is perfect with beef, lamb or poultry. 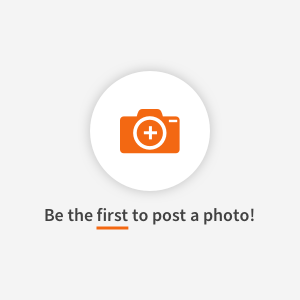 For variations, substitute toasted sesame seeds for the almonds, or carrot juice (it is surprisingly good and certainly nutritious) for orange juice. 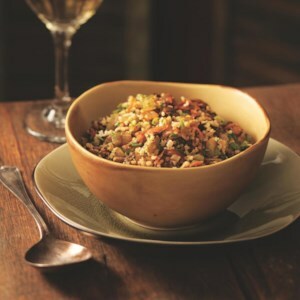 Cinnamon and allspice infuse this pilaf with a subtle Middle Eastern fragrance. Serve as a side dish or use it to stuff a large roasting chicken or capon. Quick-cooking red lentils and bulgur team up to make this hearty fiber-rich salad. Tart lemon juice plays against the sweet flavors of dried fruits, mint and cinnamon for a distinctive Middle Eastern flair; serve alongside grilled lamb or chicken. 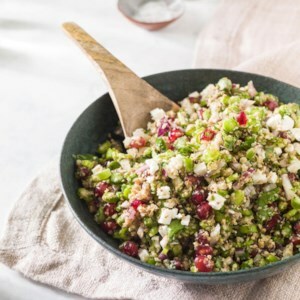 Asparagus and pomegranate seeds are a fun addition to this easy tabbouleh recipe. Serve this healthy whole-grain side with chicken kebabs, tzatziki and pita bread for a Middle Eastern-inspired dinner. One of the most important dishes at a Turkish table, this simple pilaf recipe features a combination of eggplant and bulgur. It is often an accompaniment to meat or chicken. 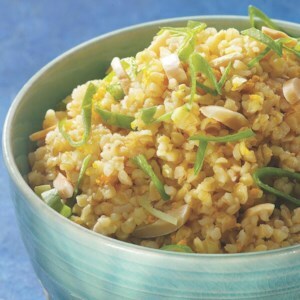 Asian flavors like soy, ginger and sesame are a nice complement to nutty bulgur in this quick grain salad. Peppery radish sprouts are a tasty garnish. A departure from classic bread-based stuffing, this recipe can also be served as an accompaniment to game.